Competitive zipped hooded top printing, full colour zipped hooded tops printed at trade print prices and dispatched on a next day courier service to Ireland. Competitive zipped hooded top printers of hooded tops, printed at very competitive printing prices. Competitive UK zipped hooded top printing. 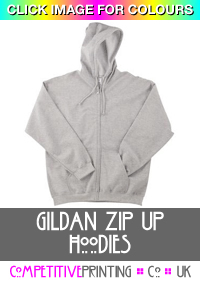 When ordering low-cost zipped hooded tops like t shirts, sweatshirts and hoodies for next day delivery within the United Kingdom. We can effectively design your zipped hooded top printing prices include delivery. We will use a next day courier to dispatch your printed zipped hooded tops. T shirt zipped hooded top printers. Competitive zipped hooded top printers delivering high quality business zipped hooded tops to Ireland. Please note: If you are ordering any zipped hooded tops other than white, ash grey, natural, light pink or light blue you will need an under base for any colour ink other than white or black. The under base adds an extra colour to your job so please take this into account when ordering. For Example: If you want to print white and red onto a black T-Shirt this would be a 3 colour job. One colour two sided zip up hoodies. Zip up hoodies printed with one colour on front and back. Two colour two sided zip up hoodies. Zip up hoodies printed with two colour on front and back. Three colour two sided zip up hoodies. Zip up hoodies printed with three colour on front and back. Four colour two sided zip up hoodies. Zip up hoodies printed with four colour on front and back. Five colour two sided zip up hoodies. Zip up hoodies printed with five colour on front and back. Six colour two sided zip up hoodies. Hoodie printed with six colour on front and back. How to upload PDF artwork for your printed zipped hooded tops or commission our designers. Design and artwork. Let our creative design team design you effective professional looking artwork for your printed zipped hooded tops. 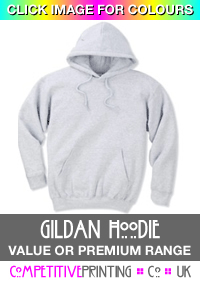 Free zipped hooded top printing artwork checks or use our low-cost design and artwork service. We offer a competitive nationwide zipped hooded tops printing service to and the rest of the United Kingdom.